Some of this may sound familiar to you. We were trying to watch TV one night when we noticed our dog Belle’s constant biting and scratching. Her skin was red, where she was biting it, but otherwise she seemed fine. We tried all sorts of distractions but there was nothing we could do to make her stop. Within days her coat was patchy, and she had angry red splotches spreading across her back legs. She was chewing, gnawing and whimpering night and day. 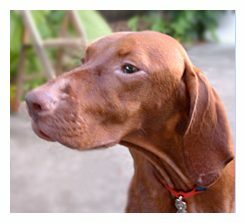 She went from a sleek beautiful dog to pathetic mess with patches of bald, raw skin and painful self-inflicted sores. My dog was eating herself up! Our vet prescribed antihistamines, steroid shots and antibiotics which stopped the itching for a bit, but then it was back! We began an un-ending series of more drugs for secondary infection, allergy tests, special allergy shots. More steroids. Sedatives. Antihistamines. Antibiotics. Special shampoo. Creams. I spent thousands and was prepared to do whatever it took but one option, helping Belle to cross the “Rainbow Bridge” I would not consider. Thoughts about putting her to sleep were heart wrenching. No way. Laying in bed that night it hit me. She wasn’t just scratching; it appeared she was trying to dig something out of her skin! Suddenly I realized with unwavering certainty that this wasn’t due to oak pollen. There had to be a reason for such intense itching and I was determined to discover the cause and find a cure. Night after night my wife & I researched like crazy – dog skin problems, allergies, ticks on dogs, dog mites, skin diseases, rashes, hot spots on dogs, fleas and microbes. I read about mange, but moved on quickly, “Mange? No way!” But now, I had to admit it. The symptoms were a match. Everything made sense. Belle had mange. After I swallowed my ego, I learned that mange isn’t some incurable plague. It’s not something that happens because of neglect. Mange is really a very common condition. 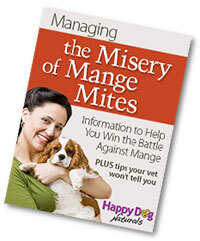 There’s a lot of information out there about treating mange mites, some bad, some good and it took time to sort out the truth from the hype. 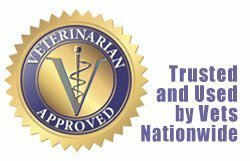 I saw many heart-wrenching photos and realized that mites can really hurt your pet if left untreated so I researched every remedy out there. Cayenne pepper? Pesticides? Lemon juice? Mouthwash? Motor oil? At the time the most often promoted option available was Ivermectin, something I didn’t want anything to do with. I respect my vet and continue to use him to this day, but I didn’t want to put a drug made for cattle into my dog. I learned it didn’t always work. So I pondered, researched and didn’t sleep much. Finally it started to come clear. After ordering enough ingredients from around the world to warrant a visit from the postal inspector, we began formulating and testing concoctions on Belle, but only after testing it on myself. Eventually we hit on a solution that gave her some relief. We saw noticeable improvement within hours, and soon she was sleeping through the night. After a few days it became apparent that healing was already underway. It seemed unbelievable, but the sores were gone after a week, and shortly after that her hair was starting to grow back! She was a new dog by the time I took her back to the dog park. Another ‘regular’ had a skin issue that looked similar. His owner was interested in Belle’s story so I brought her a supply. Another success story. She jokingly called it ‘Mite Avenge’, but the name stuck. The nightmare was over and the adventure of sharing our natural mange treatment had begun. I mixed, bottled and sold online a small batch (about 50 bottles) of Mite Avenge. I was amazed at the response from people who were facing the same situation Belle and I had faced years before. There are different types of mange mites, and we developed treatment programs for each – Sarcoptic, Demodectic and Cheyletiella. 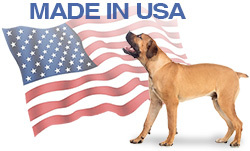 We built a large knowledge-base and made it available for dog owners world wide. She took over like a woman on a mission and Happy Dog Naturals is now a woman-owned company. The products and knowledge base she’s developed are amazing and the formula much improved. I’m proud of what she’s done to help dogs around the world. Our beautiful sweetheart has passed. 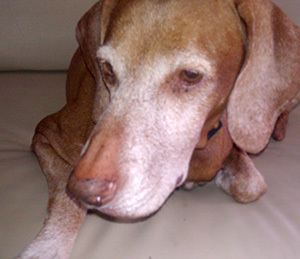 Belle was 15 when we helped her cross over the Rainbow Bridge. 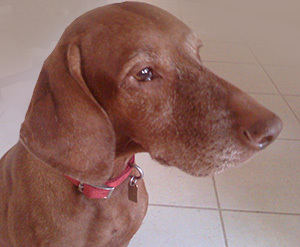 She was a touching dog and she touched so many 2- and 4-legged hearts. Ours will never be the same. It is because of Belle that thousands of dogs around the world have recovered from mange and that Happy Dog Naturals even exists. She was the sweetest soul and we’ve tried to model a compassionate company like she would if she was running things. She lives on with every dog she continues to help. And just so you know, Belle is the reason I named our company Happy Dog!